Just weeks after saying farewell to a long judicial career and promising to enjoy family, friends and life in retirement, former San Diego Judge Leo Valentine, Jr. died unexpectedly on Saturday. His death jolted the local Superior Court bench, which mourned the passing of a well-liked and respected colleague. Valentine was driving to Los Angeles on Saturday when he felt ill, and had to pull over, according to San Diego Superior Court Presiding Judge Peter Deddeh. Other motorists stopped to help, and one woman administered CPR, Deddeh said. Valentine was not responsive when paramedics arrived and later died at a hospital. The cause of death was not known. 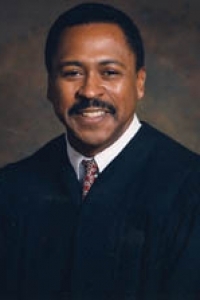 Valentine served as a judge for 23 years. He was first appointed to the San Diego Municipal Court in 1995, and then was elevated to the Superior Court in 1998 under the court consolidation program. As a judge he was known for a courtroom presence that was calm but always in command, and as a mentor to colleagues. Valentine always treated people with careful respect and dignity, said Deddeh, a longtime colleague. Valentine, 65, entered the legal profession after a stint in public transportation, according to a news release from the court. While going to law school at Western State University School of Law in Fullerton, he worked at the Long Beach Public Transport Company and eventually become the director of operations there. The company received the best-run transit division property award from the American Public Transit Association in 1989. Before Long Beach, he worked for the Orange County Transit District and San Diego Transit, according to the court news release. After graduating from law school in 1989, he joined the San Diego County District Attorney’s Office. He worked in the gang unit, where he first met Deddeh who was a fellow prosecutor, and eventually became the assistant chief of the Juvenile Divisions. Judge Randa Trapp said Valentine “had that ability to make everyone feel at home.” That was in large part due to what Trapp said was his cordial nature. Valentine is survived by his wife of 44 years, Yolanda, as well as two sons, a daughter and six grandchildren. "In Lieu of flowers please make donations in Memory of Leo Valentine to the Education Fund of : Chayahni Valentine: 750 Otay Lakes Rd #312, Chula Vista, CA 91910"